Parent Christmas Gifts & More! Are you thinking about all the lessons you still have to fit in before Christmas break, let alone all the assessing? Sometimes we just don’t have time for our students to make fancy gifts for their parents. 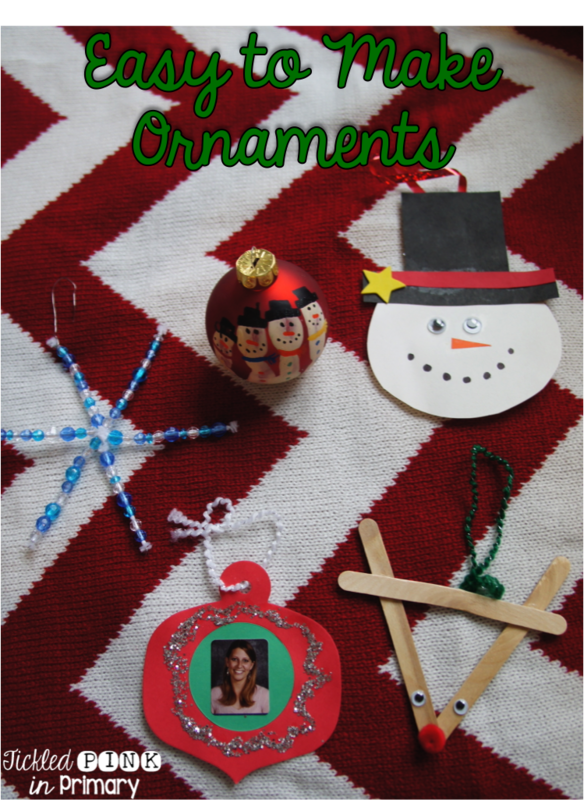 I’ve done the super cute and creative parent gifts, but sometimes had to settle for something easy like these ornaments. Read below to see how to make each one. 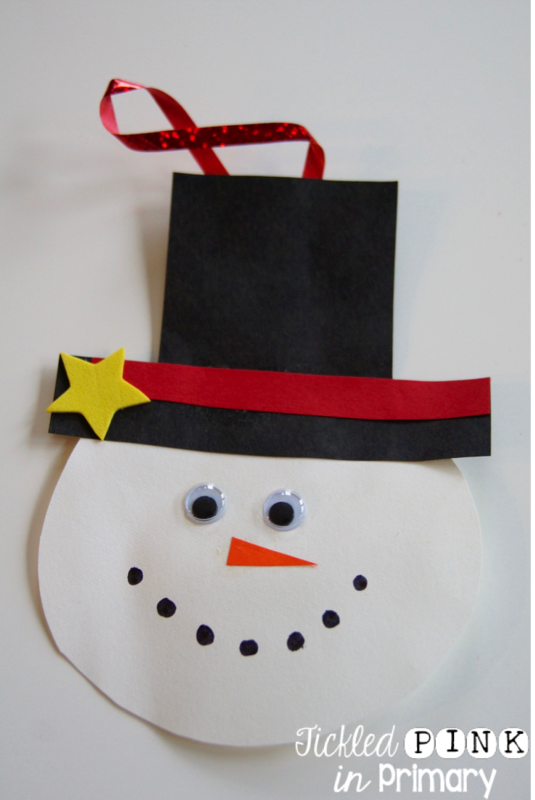 Snowman – This is a craft students can make on their own, and use my sample as a guide. I put out the construction paper, but the students have to cut out all the shapes and build their own snowman. I even show them how to make a loop with the ribbon! 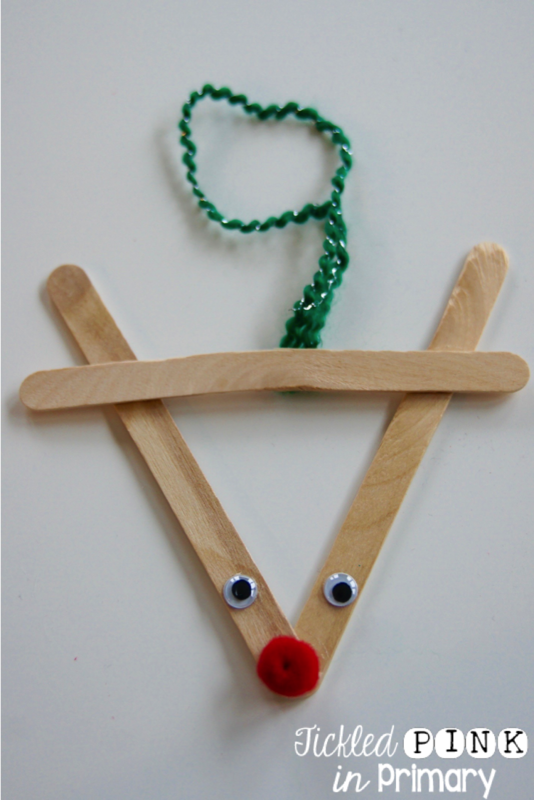 Popsicle Reindeer- Here’s another craft that students can make without much direction from you. I let the students use craft glue to make sure the sticks, eyes, and pom pom really stick on. You may have to show them that they need to leave room for antlers, because some students will make a perfect triangle. 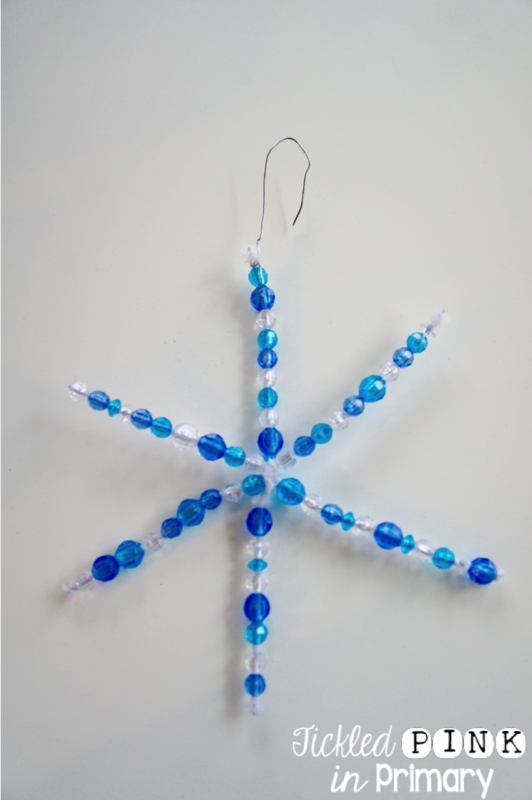 Snowflake- This craft is great practice to work on those fine motor skills! I use three white pipe cleaners, cut them in half, then twist them into a snowflake shape. I then put out a bowl of beads and let students make their own designs. I remind them to leave a little bit of room on the ends, so the beads don’t fall off. I always like how these turn out! Handprint Snowman- This is one of my favorite gifts to make for parents. They turn out adorable! I buy solid colored ornaments, white paint, and paint markers. I write their name on the back of the ornaments before we start. You’ll have to do this next part one on one. 1. 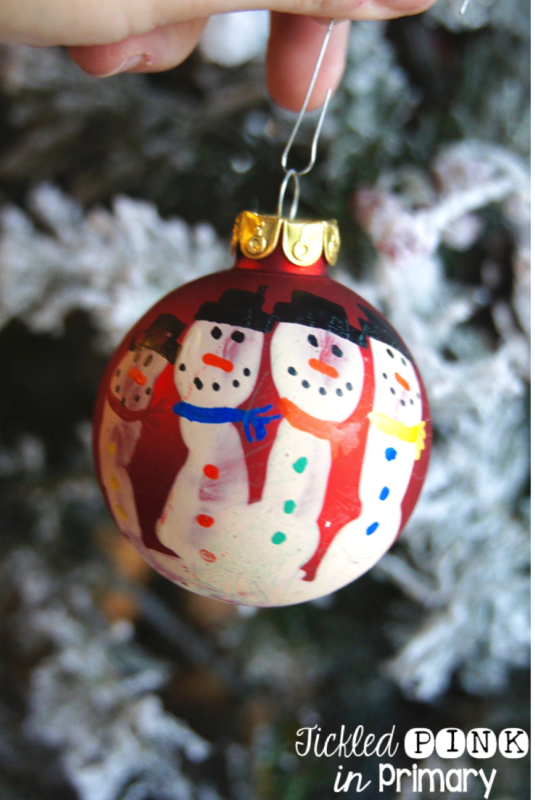 Have each student dip their hand in white paint and put their hand on the ornament. Make sure they spread their fingers out a bit. 3. Students can use the paint markers to decorate the snowman. Paper Ornament- Our school had these ornament shaped die-cuts. 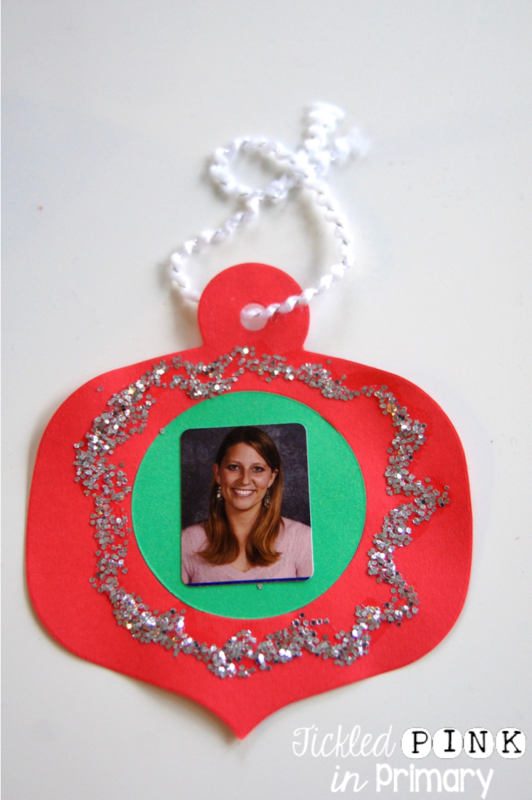 Students glue a colorful square on the back of the ornament, put their picture on the front, then decorate with glitter. 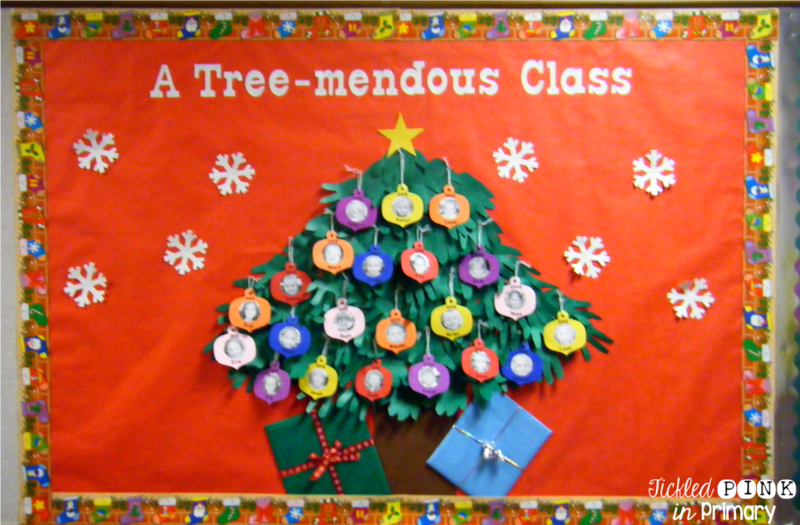 We turned this into a bulletin board and used their handprints to make the tree. If you have a little more time and don’t mind spending a little bit of money, these tiles are a great gift! They take a few days to create to do the different steps of paint, so plan ahead! I purchased these 12×12 ceramic tiles at Lowes for around 78 cents each. I wish I would have done the blue paint 1st, so here are the best directions to create these. 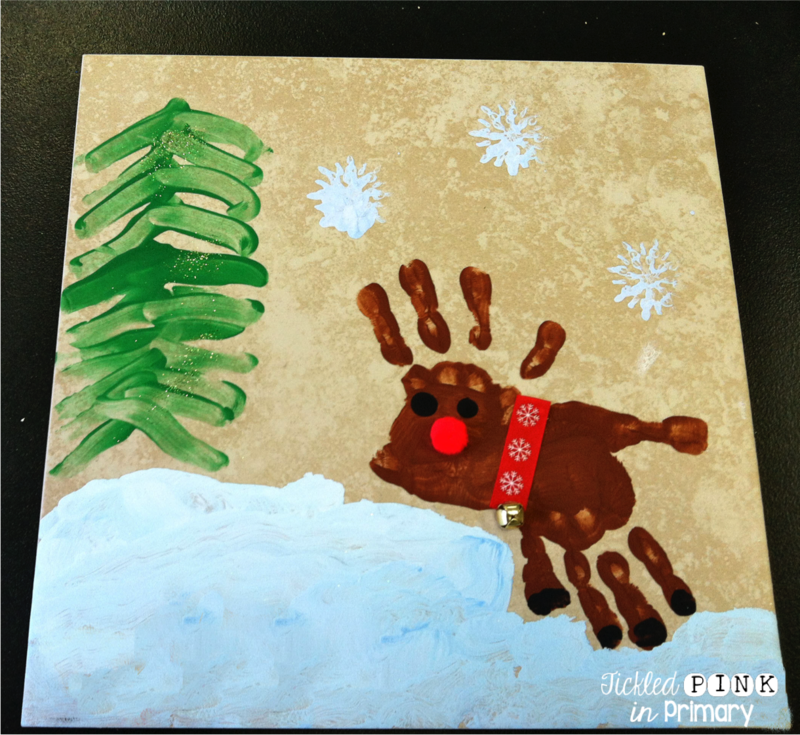 Day 1: First, have students finger paint the snow on the bottom and use a snow stamp to put snow at the top. Let this dry. Day 2: Next, students can use their fingers to make the tree. (I would have the tree coming out of the snow.) Then have students use their hands to make the reindeer. They can use the tip of their finger to make the eyes and hooves. Students sprinkled some glitter on the tree while the paint was still wet. How about some gift ideas for you to give your students and colleagues? 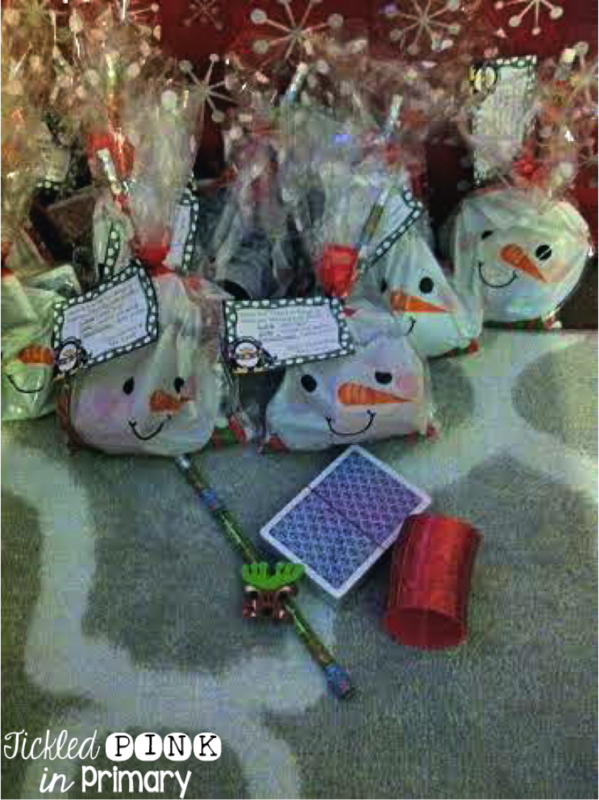 Last year I made small treat bags for my students. Our school isn’t allowed to give out candy or treats, so making those adorable Pinterest snacks I see wouldn’t work. I scoured the Dollar Tree and found some fun things that my students enjoy using in our classroom and can still help them learn over their winter break. 🙂 Each student got a pencil and eraser to work on writing, a deck of cards to play War and work on numbers, and a small slinky to work on stretching out words. I always do something small for my Kindergarten co-workers. Last year I made my K team a small tin of Pretzel Turtles. These are SO yummy and are super simple to make!! You can find the recipe below. 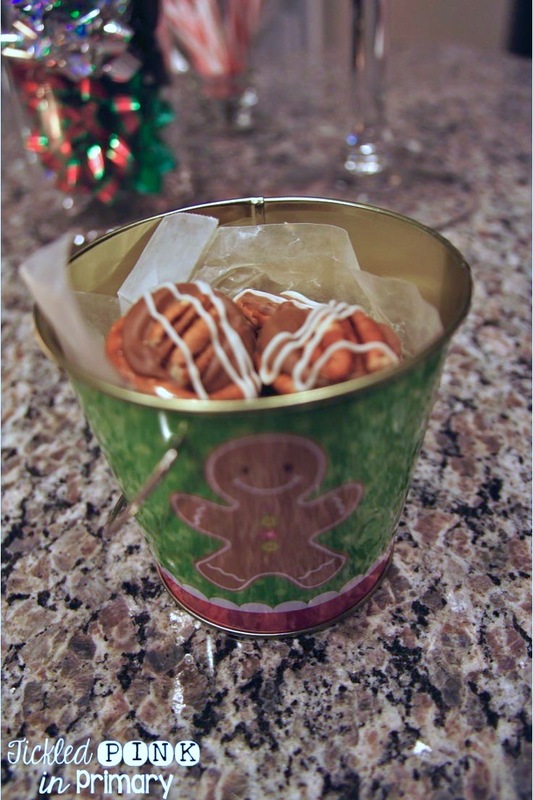 All you need are 3 ingredients: Rolos, pretzels, and pecans. I add the white chocolate icing on top to make it pretty, but you don’t have to. I got the small tins at Wal-Mart. 2. Place pretzels on a cookie sheet lined with parchment paper. Put 1 Rolo on top of each pretzel and bake for 4 minutes. 3. Take them out of the oven and put 1 pecan on top of the chocolate. Drizzle white chocolate on top if you’d like! Let cool completely or put in the refrigerator to cool quickly before putting in a container. Still looking for ideas to get through December? 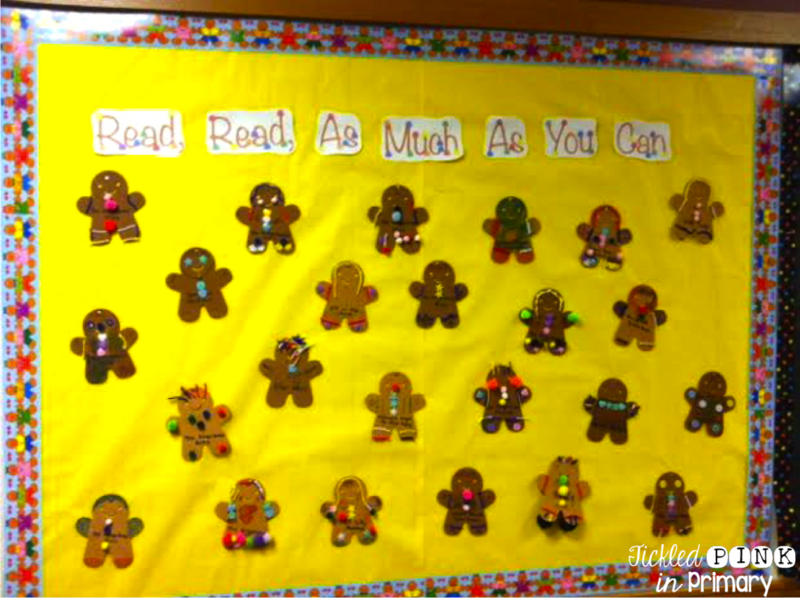 How about a few more bulletin board ideas! I found these foam Gingerbreads in the dollar spot at Target last year. We were doing a unit on the Gingerbread Man so it was perfect timing! I let the kids decorate them any way they wanted. They then told me their favorite book and I wrote it on their Gingerbread boy/girl. As I’m thumbing through pictures, I can’t seem to find a single photo of this next idea that I’ve done for many years. I make red, green, and white stockings for the students to choose from. Students have to string the stockings (great fine motor practice! 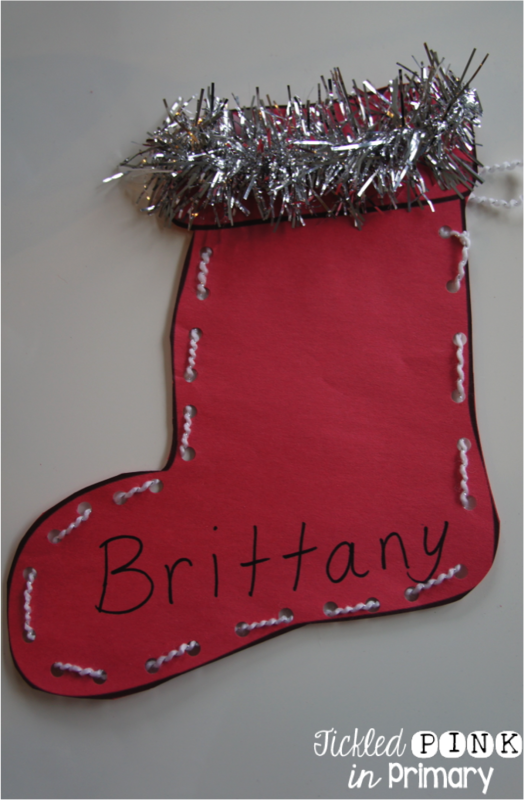 ), add the tinsel (or cotton) to the top, write their name at the bottom, then decorate the rest. I create a fake fireplace and fire out of tissue paper and bulletin board paper and then hang the stockings above it on a large bulletin board. I tell parents about our stockings and give them the option of sending in small stocking stuffers. It’s something fun for the students to open during our Christmas party. Hopefully you’ve found some useful ideas to help you get through this busy month!